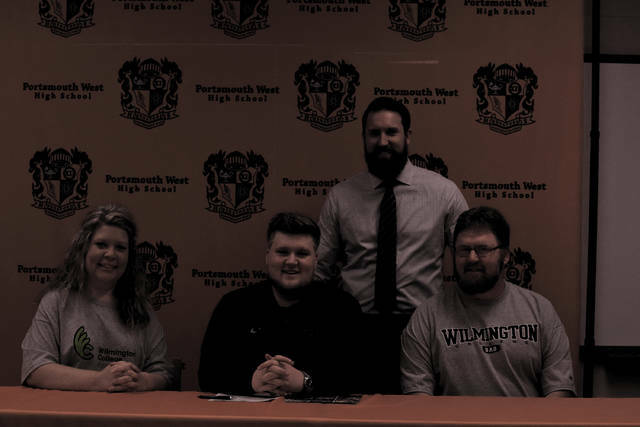 West’s Caleb Deaver signed with Wilmington College to play football on Friday afternoon at West. The senior was a consistent presence on a Senators’ offensive line that obtained 3,631 yards of total offense in 2017 on its way to a 10-2 overall record. Those are the traits that really stick out to one’s mind when discussing 6-1, 320-pound West offensive tackle Caleb Deaver, a young man who’s heart is as limitless as his overall potential from an academic and athletic standpoint. So it’s no surprise that the well-spoken and confident senior from the West Side would get snatched up in a hurry by a strong football program. For Deaver, Division III Wilmington College was that fit as the young man, who helped West obtain 3,631 yards of total offense, became the second offensive lineman for West to make his college destination official as the Senators’ bookend tackle inked with the Quakers last Friday at West High School in West Portsmouth. For Ben Johnson, the accomplishment, much like Jacob Hall’s the week prior, is one that came through sheer hard work and determination. And just like Hall, Deaver never wavered on his ultimate goal. Over the course of his senior season, West — who averaged 302.6 yards per contest on the offensive side of the football in 2017, proved to be critical behind the play of Deaver, who used his nimble feet and excellent leverage to clear up running room for Josh Berry, Dylan Bradford, and Garrett Hurd. The trio ultimately combined to run for 1,903 of the 2,261 yards that the Senators obtained on the ground in 2017, with Bradford adding 1,341 of the remaining 1,370 yards through the air on a 56 percent completion mark, as the Senators put together an impressive 38 offensive touchdowns on the scoreboard during the year — including 26 on the ground behind a strong 4.9 yards-per-carry mark as a team. In all of those areas, Deaver’s ability to set the edge proved to be a huge reason why the trio all ultimately obtained All-District honors — and why Deaver, who joined the trio on the All-Southeast District list — made the All-State Honorable Mention list in Division V.
The edge, however — that edge being of the hardworking department — was set with the leadership that guys like Deaver, Hall, Kane Lewis, and Cody Staggs set as senior leaders of the unit. Deaver’s drive to succeed, however, comes from the disappointments that his fellow seniors shared. After watching the 2014 Senators go 7-4 with a playoff berth as freshmen, the next two seasons weren’t as profitable as West won seven games combined over the following two seasons. Injuries and setbacks, which forced the Senators to settle for 4-6 and 3-7 campaigns in 2015 and 2016, motivated the 2018 senior class to amp up the energy level several notches. Fueled by the higher level of urgency, along with experiences in close games — West played within seven points or less of its opponents in nine of its 20 games between 2015 and 2016, and went 4-3 in those affairs — the Senators showed a level of poise that was impressive to watch from any team regardless of level. West went 4-0 in games decided by a single-digit margin (20-18, Fairland; 27-21, Raceland; 31-27, Waverly; and 10-7, Martins Ferry) and came back from a 14-3 fourth-quarter deficit against Portsmouth to win going away in what was arguably a season-defining victory. The above wins, which allowed West to go 10-2 in 2017 and allow the senior class to finish as only the fourth ever to record at least one playoff win in school history, is one that Deaver credits to chemistry, rhythm, and sheer determination from his teammates in an effort to redeem themselves from falling short of their own goals the prior two seasons. At Wilmington, Deaver is expected to be a big help for the Quakers, who improved to a 2-8 mark in the gauntlet that is the Ohio Athletic Conference. That mark could be in for another bump in future seasons thanks to Deaver’s ability to play all five positions on the offensive line — a quality that the NCAA Division III program thinks very highly of. With his high school career at its end, Deaver may be saying goodbye to a journey that he’s gotten to know for the last decade — and that’s hard for any athlete. However, Deaver is also getting to revel in a new journey — one that will allow the senior graduate to be to experience his future — with the people that love and care for him. And if it’s anything like his tenure at West was, it’s clear that Deaver is going to leave a big impact on his future coaches and teammates for years to come.